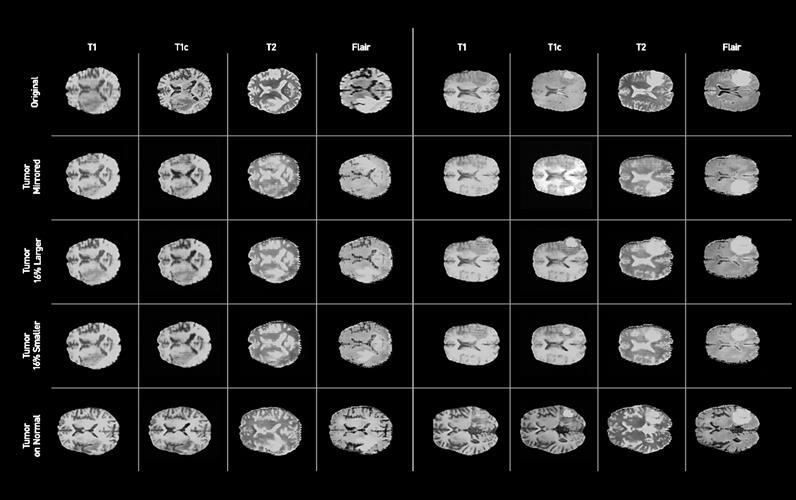 September 16, 2018 -- An artificial intelligence (AI) algorithm can produce synthetic brain MR images, solving a number of challenges in training AI algorithms, according to research presented on September 16 at the International Conference on Medical Image Computing and Computer Assisted Intervention (MICCAI) in Granada, Spain. Researchers from NVIDIA, Massachusetts General Hospital and Brigham and Women's Hospital in Boston, and the Mayo Clinic in Rochester, MN, have trained a type of AI algorithm called a generative adversarial network (GAN) to generate synthetic abnormal brain MR images. These synthetic images could be used to augment a small dataset or even on their own to train a deep-learning algorithm, according to Hoo-Chang Shin, PhD, a senior research scientist at NVIDIA. "We showed that you don't have to have access to a large number of patient images," he told AuntMinnie.com. "You can generate a lot of synthetic images and train your AI on these synthetic images -- with only a handful of real images to fine-tune the pretrained AI -- and achieve almost the same performance as if you had trained on a large number of real data." Examples of synthetic brain MR images generated by the GAN. The first row depicts the real images on which the synthetic tumors were based. The second row shows the generated images without adjustment of the segmentation label, while the third through fifth rows provide examples of generated images with various adjustments to the tumor segmentation label. The last row includes examples of synthetic images with a tumor label placed on a tumor-free brain MRI. Image courtesy of NVIDIA. The use of GANs in medical imaging has been on the rise lately for applications such as creating a synthetic head CT image from a brain MR image and for producing synthetic x-ray images to aid in algorithm training. In their project, the researchers trained a GAN using the Alzheimer's Disease Neuroimaging Initiative (ADNI) dataset and the Multimodal Brain Tumor Image Segmentation Benchmark (BRATS) dataset. The algorithm allows developers to alter the size of a tumor on the MR image, change its location, or place it on an otherwise normal brain -- enabling hundreds or even thousands of these synthetic images to be created, according to the researchers. In testing, they found that adding synthetic data to augment real MRI data improved the performance of a deep-learning algorithm. "Secondly, which is even more exciting, we can achieve similar performance using synthetic data only," Shin said. The algorithm tackles one of the big challenges of training deep-learning algorithms for medical imaging AI: the lack of reliable and accurate data for training the neural networks, he said. It can be challenging to find enough cases for a specific disease to train AI -- especially if it's a rare condition. "And secondly, even if we had enough [disease cases], annotating them takes a really long time and is very costly," Shin said. The algorithm also addresses the patient privacy issues that have hindered the creation of large datasets needed for training these algorithms. "Our algorithm can generate synthetic patient images which are not tied to a specific patient, so they are anonymous," Shin said. "It's easier to share [the dataset] outside of clinical institutions or a hospital, so we can get a large medical image dataset and train AI for a well-performing AI algorithm." The researchers have made their code publicly available on GitHub.